A $2.50 First Class mail charge applies to Mar/Apr 2019. I read the magazine because I grew up in New Orleans, and words can't describe how much I miss home! I try to get back as often as I can, but cooking the recipes in the magazine keeps me close to home! You know, it's all about the food! I look forward each week to the email I receive from you. The magazine is an even bigger treat. I like to see illustrations when I cook and you all do a very good job of showing what the end product is supposed to look like. In addition, I like the article you have on various chefs and how they achieved the success they enjoy. I love preparing Creole ( Cajun) dishes and your magazine is one of the best. As a Charter Member I always look forward to each new issue....Louisiana is so culturally and cuisine rich and the publication is a great vehicle to hone in on all the state's 'happenings' and find special, regional recipes. I loved hearing that you have circulation in all 50 states AND some foreign countries! That's awesome!!! I LOVE my Louisiana Kitchen & Culture magazines for so many reasons. I've been a charter subscriber since the magazine began and have probably made at least one recipe or more from each publication, all with much success and gratitude. Plus visited so many of the restaurants showcased in the magazine because of the information provided by ya'll. And the photography? Beautiful. I do freelance and can recognize great shots in a heartbeat.....you make the food look irresistible and like works of art!! Hey Susan, I love the magazine….it’s easy to read, very informative, has great recipes – and I’m a sit in the rocker with a cup of tea or coffee reader who enjoys the pleasure of the printed word! Computers are great (all kinds) but sometimes it’s just so much nicer (and easier) to sit down with a “good book”….no problem with connections, the internet, etc. It keeps me in touch with New Orleans while we're back in CA. I can stay current on restaurants and chefs. Love the recipes! I grew up and lived in Louisiana for 30 years. Reading the magazine takes me back home. It inspires me to visit LA more often and my family has developed a love for beignets which they have to have at least once every time we visit. The boys are enjoying the red beans and rice, jambalaya and crawfish etouffee that I make at home. But there's nothing like going home for it. Thanks for putting out such a wonderful publication. Your magazine brings so much attention to the amazing cultures in our wonderful State. Not just the delicious recipes but also the people, the cities, the festivals, etc. I have lived here all of my life (63 years) and I learn something new from every issue and can’t wait to visit that area, eat at a restaurant you feature, or attend one of the festivals or events you highlight. Thank you reinforcing why I love Louisiana. I look forward to each issue. I love this magazine because I'm moving back to LOUISIANA and love the food And enjoy looking at the dishes and SAVOR the flavor. Nothing better, and best editor in chief ever! It's a fabulous magazine. It's not just the recipes I love, although they're all delicious, but the stories about the people behind the great food and culture. All very, very different from Texas and endlessly fascinating. I love my home state, but would move to Louisiana in a heartbeat. Keep up the good work, and while I'm thinking about it, I believe I'll renew my subscription. I read Louisiana Kitchen & Culture because: It gives bits of history for Louisiana. The recipes -Crayfish bread - were wonderful. It makes me want to travel to some of the out of the way places to try the food. Every article is written to open new ways of cooking, looking for the new place to eat. The folks at the magazine are wonderful to talk with and very helpful. Just a great magazine. Look for ward to each issue. Readers love to see pictures with a recipe. You do that. Your magazine is easy to read and not intimidating. Every thing seems delicious when you read the recipe so it makes you want to try them. Very simply, you have the best collection of recipes, from classics to new ideas. Add great stories as well and your magazine is wonderful. Though I get subscription offers from time to time for the other magazine, there is no way I will switch from yours. It is more than just recipes. The magazine really knows and shows what it is like to live in Louisiana. While Louisiana is known for it's food, it is also known for the people who create this food. Only Louisiana Kitchen & Culture brings you both stories. The Louisiana regional food is so completely different than we have up here in the Pacific Northwest and we love to learn about great food. We also appreciate that the magazine doesn't focus on just the big restaurants and top chefs - they also feature small, local restaurants and local family cooking. The close up fod photography is over the top and makes us want to try out the recipes. The magazine actually inspired us to visit New Orleans and sample the amazing local food. Yum! I love the print version because I sit in my comfy chair to read thru it all, then set it by the stove & cook from the recipes. An e-version doesn’t do it for me. I go back to my old ones all the time - I can tell my favorite recipes by the stains on the pages. Plus I get (and trash) a million e-mails, but I only get a few magazines – and this is one of them – something I want to save & re-use. Hi Susan, Keep up the great work! I love to plan my menus around your suggestions, trying something new is also great but most of all I love eating what I cook!!! It is all so good! 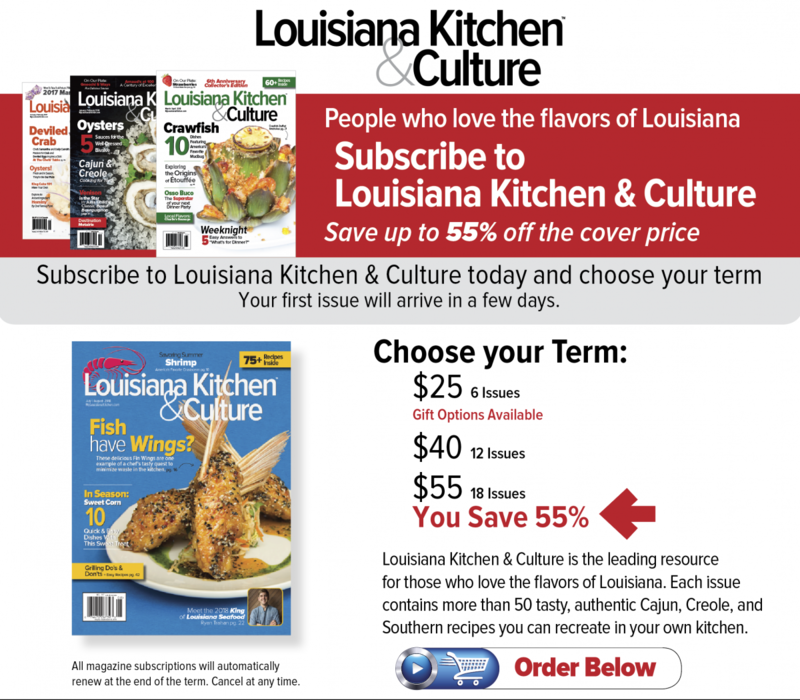 I read Louisiana Kitchen & Culture because I love reading recipes. Hi Susan, We LOVE LOVE LOVE this magazine; my husband and I both read it and we both love to cook. I think the reason we love it so much is for the variety of recipes (with pictures) from around LA and the stories of places we’ve been and some where we’ve never been and hope to visit. We love Louisiana, and your magazine portrays the people, food and places of LA well. The emails you send out are also a big PLUS! Keep up the good work! 1. The high quality paper that it is printed on indicates the quality of what's inside. 2. The pictures throughout the magazine are bright, bold colors making them attractive and appealing to whatever they represent. 3. The articles are short and to the point and the accompanying pictures give more meaning to the article. Being short and to the point means the article holds your attention without becoming boring. 4. There is a broad abundance of excellent recipes, again with pictures, that focus on whatever appeals too me. Whether it is breakfast, lunch, supper, sides, snacks, drinks or hor d'oeuvres. 5. The food-focused ads and alerts of up-coming events keeps me well informed. 6. The annual subscription price is a bargain compared to what the magazine has to offer. In summary, I wouldn't hesitate to pay twice the subscription price for the information and quality of the magazine. I read every page from front cover to back cover. As I've told you in the past, "great job, Susan", don't change a thing!